CASHPOINT was founded in 1996 and has established itself as one of the leaders in the sports betting and entertainment sector in Austria and Germany. CASHPOINT is strongly positioned not only in Germany and Austria but also in Great Britain, Denmark, Belgium, Greece and Cyprus. Cashpoint operates an extensive internet platform and more than 5,000 outlets in the form of betting shops, kiosks and hospitality venues with self service terminals. 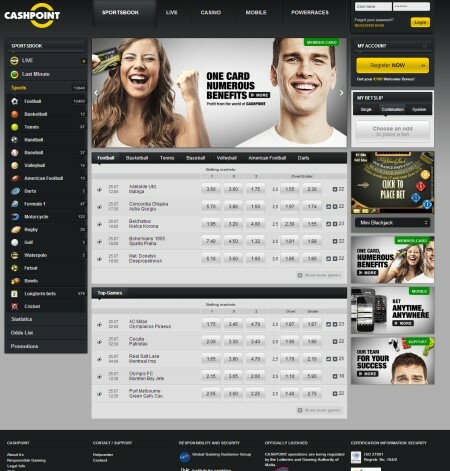 The Cashpoint.com betting site operates a sports betting platform and online casino product. The sports betting site provides competitive betting odds on a wide range of European and International sports and offers 1000's of betting opportunities particularly in the European football market where the coverage of leagues is very extensive. The casino provides an excellent range of slot machines and table casino games and a live casino also forms part of the casino product, where players can enjoy playing live roulette and blackjack games. No download is required to play the casino. The Cashpoint website supports mobile gambling natively so players can bet easily with their mobile telephone or tablet device. Overall a well designed online gambling site that is very simple to use. A deposit bonus is available for new customers and the site supports all of the popular methods of depositing methods. A Cashpoint member card is available for customers that offers enhanced betting benefits and also the ability to deposit and withdraw funds from your betting account at Cashpoint Betting Offices.